Project 13 is an art gallery / painting studio. We promote and support creative artists by providing workshops, events and exhibition space. We collect and sell unique art and handicrafts from different regions, especially from Asia. Our collections include paintings, sculpture, and selective gift items. Our events are conducted & hosted by individuals to promote art appreciation among the community. 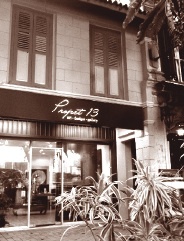 Project 13 gallery is currently﻿ CLOSED. Process of relocating in Washington DC. USA.